Sophie Grigorievna Volochine was born in Kharkoff, Ukraine. When 16 she married a student with whom she had a son who was killed at a comparatively young age, and a daughter, Lenotchka Savitsky. She divorced the student and then married a mining engineer. 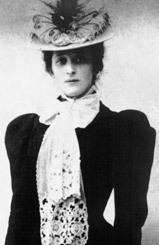 Mme Maximenko, as she was then known, was introduced to Gurdjieff in 1916–17 by P. D. Ouspensky. Thereafter known as "Mme Ouspensky," it is not clear whether she and P. D. Ouspensky ever married. An early member of the St. Petersburg group, she became a lifelong and loyal pupil. She was one of six people Gurdjieff appointed to act as Assistant Instructors at the Institute for the Harmonious Development of Man at the Prieuré; he later sent her to assist Ouspensky in England, where she became a teacher in her own right. She developed Parkinson's disease in the summer of 1939. In 1941 she left for America where she taught, despite being bedridden, at Franklin Farms, Mendham, New Jersey, until her death December 30, 1961. When Gurdjieff went to Essentuki in February 1918 Mme Ouspensky joined him there, along with some 40 fellow students. When Gurdjieff left for Tiflis, Georgia, the following year, she and her daughter stayed in Essentuki with P. D. Ouspensky; they later went to Constantinople in February 1920. When Gurdjieff and his students arrived there in June a struggle for her allegiance developed between Ouspensky and Gurdjieff.2 But she was very clear as to who was the teacher and who the pupil. "I do not pretend to understand Georgy Ivanovitch. For me he is X. All that I know is that he is my teacher and it is not right for me to judge him, nor is it necessary for me to understand him. No one knows who is the real Georgy Ivanovitch, for he hides himself from all of us. It is useless for us to try to know him, and I refuse to enter into any discussions about him. "3 When Ouspensky left for London in August 1921 she stayed with Gurdjieff, later accompanying him to Germany and then to Avon, France, where in October 1922 he established his Institute at the Prieuré. In 1941 the Ouspenskys established a working school at Franklin Farms in Mendham, New Jersey. P. D. Ouspensky spent much of his time in New York lecturing and writing, while Mme Ouspensky supervised the community in Mendham. By late 1942 she had become so crippled that she spent most of her time in bed, but still directed activities and taught her students about fundamental principles for doing practical work. Unlike her husband, Mme Ouspensky placed much value on the Movements and saw that they were taught both at Lyne Place and at Franklin Farms. When P. D. Ouspensky died in 1947, Mme Ouspensky advised not only his students (there were about 1,000 in London alone) but also her own to go to Gurdjieff in Paris. Many, because of the war and the ban Ouspensky had placed on speaking of Gurdjieff, were not even aware he was alive or feared he had become mad or senile. Among those she told were Lord John Pentland and Christopher Fremantle. When Gurdjieff visited New York in the winter of 1948–49 he went to see Mme Ouspensky at Franklin Farms. Later, she sent Gurdjieff a chapter of P. D. Ouspensky's drafted book, then called "Fragments of An Unknown Teaching," asking if it should be published. Upon reading it, Gurdjieff said, "Very exact is. Good Memory. Truth was so. "6 He instructed her to publish it, but to wait until after his own book Beelzebub's Tales to His Grandson came out. She published the book in America under the title In Search of the Miraculous. "All work is based on watchfulness. The man who works realizes he is a machine and fears his machine. Therefore he watches.... Study yourself as a machine in which different processes are taking place." "For consciousness, collection of attention is necessary. Attention is as oil in the lamp. Consciousness is the light. Where there is consciousness things are illuminated." 1. Gurdjieff International Review, His Pupils: "Madame Ouspensky," http://www.gurdjieff.org/. Varying dates are reported for her birth and death. James Webb in The Harmonious Circle states her birth date as 1874, and Sophia Wellbeloved in Gurdjieff: The Key Concepts claims she lived from 1874–1963, and James Moore in Gurdjieff: The Anatomy of a Myth cites her death was in 1963 as well. 3. John G. Bennett, Witness (Charles Town, WV: Claymont Communications, 1983), 128. 5. James Webb, The Harmonious Circle (Boston: Shambhala Publications, 1980), 390. 9. Kenneth Walker, A Study of Gurdjieff's Teaching (London: Jonathan Cape Paperback, 1965), 93. 10. Robert de Ropp, Conversations with Madame Ouspensky 1939–40 at Lyne (Far West Press, 1974).